The MBA internship program is a required course for the students who are completing the course work for the MBA program of IIUC, Dhaka Campus. It is a 3 credit hour course with duration of 8 weeks. Students who have completed all the required courses are eligible for this course. Broad Objective: The overall aim of the study is to assess the satisfaction of NCCBL’s banking services in among the users. • What are the key facilities that influence the satisfaction level of customers? • The deficiency of current service. • To suggest ways of improving the service standard that accommodates a rapidly growing customer volume. This study was deal with the NCCBL’s banking service and Customer expectation level, their need and want & Future potential assessment of NCC bank limited. This study was cover only Dhaka city specifically Dhanmondi, Mohammadpur and in the neighborhood area because of Dhanmondi branch. Corporate clients, Small and medium sized enterprises and individual customers are the main population of the study. As part of the investigation of customer’s satisfaction about the banking service of NCCBL the interview respondents were given a multiple choice questionnaire to explore their understanding related to this banking service. An exploratory research was done to establish multiple choice questionnaires so that it will reveal the ideas of customer. The questionnaire consists of 18 questions with multiple choices and liker scale. Respondents were engaged at a variety of ideas with face-to-face interviews or to persuade them to self complete and return the questionnaires. The population designed for this study limited to Dhanmondi branch. Non probability sampling procedures were used for selecting the samples. It was selected through convenience and judgement. Clients of NCCBL are mainly the targeted population like businesspersons, corporate clients, small and medium sized enterprises, employees, professionals, students. The sample size for the survey was 51 altogether. Among these 21 respondents from saving account holder, 9 from current account holder, 8 from loan customer and the rest 13 from others like money gram customers, special saving scheme customer. Before starting my survey my sample was 75. But because of time limitation it decreased by 51. In order to cover a wide range of respondents and to achieve the research objectives, the attempt was made to select the sample from the existing account holder from all the departments of the Dhanmondi Branch. Data Analysis was done mostly with the help of SPSS through table and statistical data comparison tools like Average, Standard Deviation, Mean, cross tabulation, descriptive analysis and frequency analysis. • Lack of comprehension of the respondents was the major problem that created many confusions regarding verification of conceptual question. • Limitation of time was one of the most important factors that shortened the present study. Due to time limitation many aspect could not by discussed in the present study. Due to time constraints, the sample size had to be restricted to 51 only. • Rush hours and business was another reason that acts as an obstacle while gathering data. • The finding of the survey is based on customers’ response in National Credit and Commerce Bank Limited Dhanmondi branches located in DhakaCity only. The report is contained Seven chapters. Chapter one is Introduction part, which included objective of the report, scope, limitations, and methodology. Chapter two the Organizational part gives the idea about National credit and commerce bank limited (NCCBL) historical background, different divisions, banking services. Third chapter is contained Working Report that is mainly discussed about my experience during 8 weeks internship with the NCCBL. Fourth chapter, the project part is explained the main study about the customers’ satisfaction level of banking service that NCCBL offers through research work. The fifth chapter is contained findings from survey. The sixth Chapter is recommendations and the seven chapters is Conclusion. National credit and commerce bank Ltd. (NCCBL) bears a unique history of its own. The organization started its journey in the financial sector of the country as an investment company back in 1985. The aim of the company was to mobilize resources from within and invest them in such way so as to develop country’s Industrial and Trade Sector and playing a catalyst role in the formation of capital market as well. Its membership with the bourse helped the company to a great extent in this regard. The company operated up to 1992 with 16 branches and thereafter with the permission of the Central Bank converted in to a full fledged private commercial Bank in 1993 with paid up capital of Tk. 39.00 crore to serve the nation from a broader platform. During last 12 years of its operation NCC Bank Ltd. Has acquired commendable reputation by providing sincere personalized service to its customers in a technology based environment. The bank has set up a new standard in financing in the Industrial, Trade and Foreign Exchange business. Its various deposit and credit products have also attracted the clients – both corporate and individual who feel comfort in doing business with the Bank. To mobilize resources from within to contribute to development and growth of the country and also to play a catalyst role in the formation of capital market. To become the best Bank of the land in respect of service, profitability and strength. • Setting up of Small and Cottage Industries/Projects. • BMRE of existing projects. • Other fixed assets of other Productive and service oriented ventures. A commercial bank is a lender of borrowed money. It borrows from those who have surplus fund, and lend to those who are in need of temporary accommodation. • Passport size photograph of the account holder along with Transaction Profile. Two types of account can be opened under this scheme. One for term of 5 years and another for a term of 10 years. Rules for both the accounts shall be the same. Appendix C: Monthly Installment and amount to be paid on completion of time. Cardholders can also pay their Telephone bill (BTTB), Mobile phone (Grameen phone) and more utility bill payment facilities are in pipeline. NCC Bank is member of world renowned MasterCard and Visa International. National Credit and Commerce Bank Limited to have joined hands with MoneyGram Payment Systems Inc to serve expatriates to send money back home quickly from anywhere in the word. Moreover, money can also be sent quickly through MoneyGram from Bangladesh to other parts of the World as is done through the banking channel. MoneyGram Payment system Inc is a non-back provider of electronic money transfer service. MoneyGram is providing its customers a service of an unsurpassed quality and superior value. MoneyGram has over 25,000 Agent locations throughout the world. Persons anywhere require transferring cash quickly, reliably, conveniently and at attractive prices to more than 115 countries can depend MoneyGram agents for the service. At NCCB, they provide the Recipients immediate attention ad due care. They have made it a point to pay the Recipient within minutes. The Recipients need not require having a bank account. NCC bank does not levy any extra charge. They give a better exchange rate to the Recipient. The Recipient can approach any for the NCC Bank branches at his convenience for payment. In 2003 NCC Bank Ltd. as part of fulfillment of its social commitment has taken steps to extend credit facility to the marginal farmers in the remote northern part of the country at Patgram, Lalmonirhat to cultivate maize. The project being implemented by a local enterprise has come out to be a fruitful one and being considered as model for the Banks interested in Agro-based financing. (bordering India) connected through “Tin Bigha” corridor. International Business is one of the major sources of income of the Bank. The bank is giving proper care to serve the importer and exporter of various items with its officers having expertise in the respective field. During last year 2004 the bank handled export and import business to the tune of Tk. 577.00 crore & Tk. 1327.00 crore respectively. The Bank has a good network of correspondent banks around the world for its international banking business. A total number of 300 reputed international banks with a wide coverage in more than 50 countries across the globe are effectively catering to the rapidly changing requirements of the valued customers. The Bank also has arrangements with exchange companies in the Middle-east and international money transfer companies like Money gram and Placid NK Corporation in the US to facilitate the homebound remittances of expatriate Bangladeshi communities around the world. Steps are being taken to conclude arrangements in UK and other parts of the world to attract the growing remittances of Bangladeshi expatriates working there. The Bank is a member of SWIFT which provides a fast, secured and accurate communication network for financial transactions. All the 17 Authorized Dealer Branches of the bank are connected to SWIFT rendering the state-of-art services to its clients. During my eight weeks of work experience with National Credit and Commerce Bank Limited (NCCBL) on my internship program, I was placed in the general banking and loan division at Dhanmondi Branch. I have gathered an important experience of handling a lot of works. In National Credit and Commerce Banks, my main task was to assist to the officers in general banking and loan division, which helped me to gain practical experience on handling different type of customers. This has definitely enriched my practical experience and united to theoretical knowledge. Everyday a bank do many transactional works in different account categories like CB, SB, CC, STD, SOD(G), SOD(FO) etc. Whenever a transaction occurs there must be a voucher. So after finishing transaction lots of vouchers create. Next day general banking section works with those vouchers from sorting to voucher register. According to different categories of account I did Voucher supplementary. It means all the accounts were together. My work was to serial voucher according to different categories. After voucher supplementary I did voucher count. There are three different categories voucher. Those are Cash voucher, Clearing voucher and Transfer voucher. According to these three categories of voucher I have counted how many cash, clearing and transfer voucher I got and side by side I wrote it in the debit and credit voucher head. When the entire different categories account voucher have finished I had need to write it in a cover voucher. Voucher register is the last step of vouchering. After completing the entire different accounts voucher under a voucher cover we need to register it on the register book. I issued different accounts check book in general banking section. Those are current account, saving account and special saving scheme (SSS) account, Check book contain different quantities leaf according to different account. Following I shows different accounts check books leaf amount. To cut the installment against a loan account need to voucher. I did vouchering for Small Business Loan (SBL), term loan. I also prepared transfer account voucher. Here I checked validity, security and amount. Under the direction of assistant vice president, officers of general banking, loan division, cash division and money gram section I, used to handle the works whenever they assigned me. All the employees with whom I got the chance to work were very helpful and they always tried to help me. So I am very much appreciated and it was my great honor I was with them. After getting all the data from the clients I have analyzed through the SPSS software using different statistical tools to find out the satisfaction level of the customers. Mainly I have used the popular tools for measuring satisfaction of the customer is standard deviation, frequency analysis, cross tabulation. The transformation of raw data into a form that will make them easy to understand and interpret; rearranging, ordering, and manipulating data to generate descriptive information. Here I picked “Likert Scales” question for descriptive analysis. How much do you satisfied with NCCBLs’ sesservice of giving statement? Though there are five options for this question respondents were selected three answers. Those are highly satisfied, satisfied and moderate. Mean 2.20 indicates that more than half number of respondents (31) select satisfied answer. They neither highly satisfied nor moderate satisfied regarding NCCBLs’ service of giving statement. Standard deviation is .601 which means the distance of the respondent answer is not that much far from one respondent to another respondent. What is your opinion scale regarding current service (eve! of NCCBL? All the respondents’ have selected 3 to number 5 option means average, good and excellent option. More than half number of respondents (28) gave their opinion good regarding current service level of NCCBL. Mean 3.98 almost 4 indicates the answer is neither average nor excellent and standard deviation .678 means respondents answer was not far distance from each other. Which section do you like most? 1. What is your main occupation? Among 51 respondents in NCCBL 14 respondents selected their occupation business. 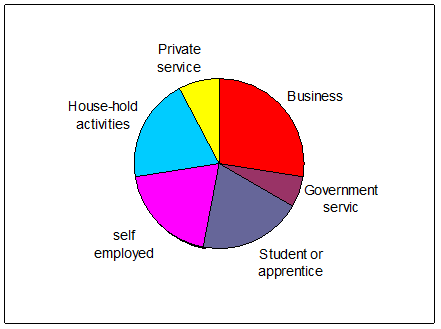 Three groups (student, self employed and house hold activities) each number contain 10 respondents. From my survey I saw very few government service holders maintain their bank account with NCCBL. Their number is only 3 among 51 respondents. 2. How you are related with NCCBL? How you are related with NCCBL? Most of the respondents (41.2%) have selected their relation with NCCBL by saving account. Second largest (23.5%) relation between NCCBL and respondents came from money gram. 17.6% respondents were from current account and 15.7% were from loan customers. 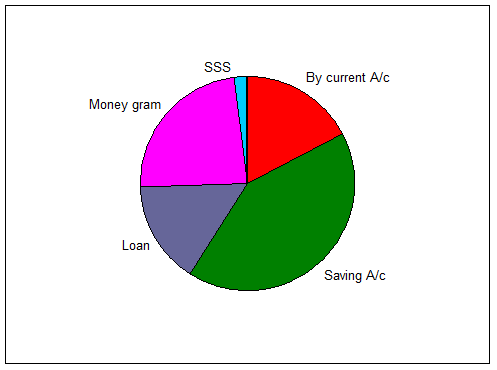 In the pie chart we can see green color from saving account and pink color from money gram. 3. From where did you get information of NCCBL? From where did you get information of NCCBL? 62.7% respondents selected their option regarding NCCBL information they got from family or friends. It indicates that most of the NCCBL clients come by listening to others. For any organization it is very important factor. Because of NCCBLs’ better service they got these 62.7% extra clients without any communication activities. 4. Why did you choose this particular branch? Almost half percent (49%) respondents have preferred reason to choose this particular branch is “nearest to home”. But I can’t ignore the option “management is friendly” because 19.6% respondents have selected this one. During my survey most of the respondent told me NCCBLs’ management is very friendly. But as their first choice reason was nearest to home. 5. How long you are involved with NCCBL? How long you are involved with NCCBL? Most of my respondents (31 persons) selected their involvement was not too many year with NCCBL. Only 1 – 2 year they involved with NCCBL. If we consider pie chart it will be dearer. 15 respondents (29.4%) pick their involvement 2-3 years with NCCBL. But one thing I want to say that though they are not too much time involved with NCCBL but maximum of them give their opinion towards the NCCBL regarding better service. 6. What improvements would you like to see? 18 respondents (35.3%) wanted “quick work” as an improvement in NCCBL. 12 respondents wanted more interest rate than current rate. Their judgment was in NCCBL everything is fine but they give lower rate than others. So it should be rise. The same thing happened for loan customers. 6 (11.8%) respondents from loan want to see lower interest rate against their loan as an improvement in NCCBL. Cross tabulation is a technique for organizing data by groups, categories, or classes, thus facilitating comparisons; a joint frequency distribution of observations on two or more sets of variables. My selected cross tabulations are in the following. I also included vertical and horizontal bar chart with every cross tabulation. According to your account category, do you think interest rate is ok? My first cross tabulation is between gender and satisfied regarding interest rate. Among the 33 male respondents 16 didn’t want to comment and 10 respondents said they are not satisfied with current interest rate. So we can easily understand maximum numbers of male clients are not satisfied with interest rate. The same case for female clients also. The finding is based on 51 samples. • The majority numbers of clients (62.7%) get information about NCCBL from family or friends. Rests of all (37.2%) get information from advertisement, job/ Colleagues and others. • Nearest to home is the first choice of the clients (49%) to select this Dhanmondi branch of NCCBL. • Out of 12 respondents from money gram only 3 like money gram section though they have more relation with money gram. Some recommendations are proposed below which may help NCCBL to eliminate gaps between the expected level of service and actual level of service. Set charges consistent with competitors’ charges pattern: Some of the local banks such as Brac Bank, Dhaka Bank, are planning to launch similar products like Personal Loan for Consumers with a lower rate and charge. SCB should take precautionary measures to keep their products viable to customers both new and old. Reduce charges: NCCBL should lower their charges immediately so as to prevent the loss of customers. On-the-job training: NCCBL senior officials should be more cooperative to their subordinates and arrange for workshops/ training programs to keep them motivated in their work. Recruitment of more skilled workforce: NCCBL should recruit more qualified, more skilled and smarter salespeople, who will be able to persuade eligible customers to have a banking relationship with NCCBL. Easier procedures for opening accounts: The bank should do away with the procedure of asking the same information from the customers more than once in connection with opening a bank account. They should eliminate the current procedure which involves so much of paperwork as this often irritates customers. Training and organizational learning: The branch officials should go through training and other motivational programs more often that would liven up their spirit of work to a great extent. All the clients of my survey have relationship with NCCBL. They are the customers of bank service. These customers include public limited companies, private limited companies, small and medium sized enterprises, professionals government bodies, employees of different organizations, and even students and housewives. Today bank is a very important role player in the economy of the country as well as in the world. These customers are transacting through the banks several times every month and each transaction involves them some monetary cost and time cost. From my survey that I got simply want to say that customers of NCCBL are satisfied with the current banking services. They have one objection regarding interest rate except that everything is ok. I want to give a good news before ending my conclusion that NCCBL just inaugurated credit card of Visa brand with access both in International and local market. It’s an interest free credit card.